This past Sunday was the last day of the exhibition: Secrets of Buddhist Art: Tibet, Japan, Korea at the Frist Center for Visual Arts in Nashville. As part of the closing day there was a ceremony and the destruction of the sand mandala. 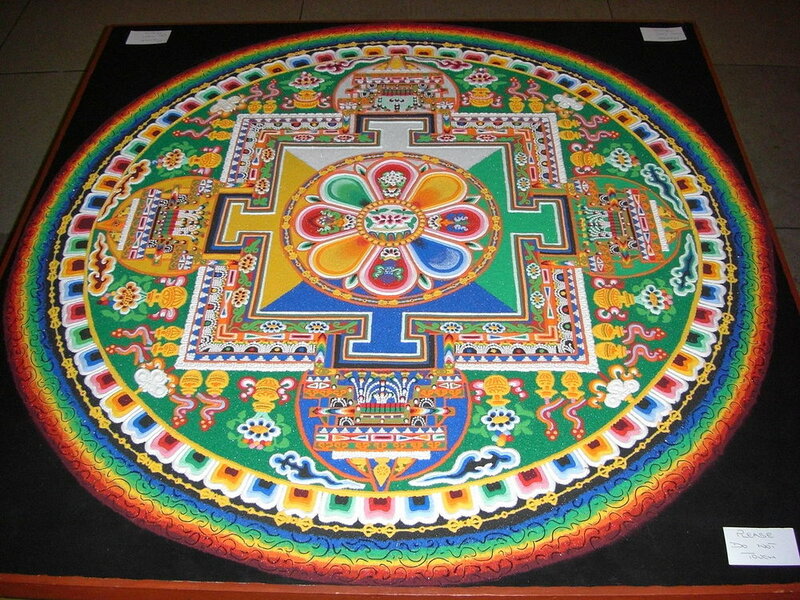 The destruction of a sand mandala is a metaphor for the impermanence of life and a means of releasing its healing power. During the closing ceremony, the sand was swept up and placed in an urn. Traditionally the sand is carried to a nearby body of water where it is deposited. However, the sand from this mandala will be distributed to the eight Frist Center Sustaining Community Partners to spread the blessings of the mandala across Nashville. It seemed sad that this beautiful work of art was made with the knowledge that it would eventually be destroyed. For the 12 weeks that it was on display, it brought beauty into the world both with its colorful design and the ceremonies and rituals that surrounded it. I understood the metaphor of the mandala and the impermanence of life and how we are also brought into the world as a beautiful work of art. In my Christian religion, the blending of the sands to its destruction would be a reminder that “all come from dust, and to dust we will return.” (Ecclesiastas 3:20). Just as the colored sands gave up their individual identities to become a mixture of yellow-green, as Christians we are called to give up a part of ourselves. As we live our lives together in our temporary vessel, we are reminded that each day we need to give a part of ourselves away as a blessing to others.